This entry was posted in 1 Beekeeping and tagged 1 Beekeeping, 8 Brookfield Farm & Bees, Apis, bee, bee health, bees, Brookfield, Brookfield Farm, Cape Honeybee, capensis, cerana, diseases, health, hive, hives, honeybee, honeybees, Maple Falls, mellifera, mites, pests, Tropilaelaps, USDA, Washington. Bookmark the permalink. 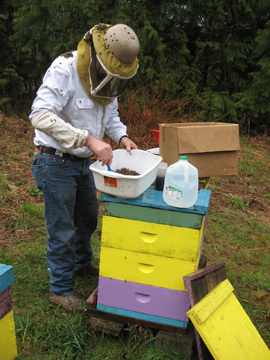 I’ve thought about writing an e-book – but things change fast in the world of beekeeping, so it would never be finished. New techniques arise, new issues occur, ways of dealing with them change. There’s a lot of good books out there. I’m so uninformed about the web I have no idea what “guest authoring” is (I hang my head in shame) – but that sounds fun.